Gopal Modi, Executive Director, Mtandt Group. 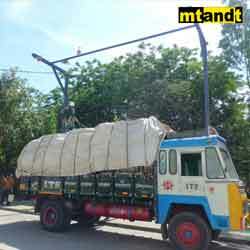 Founded in 1974 by Late Shri Rajkumar Modi, Mtandt group is one of the leading players in the equipment market offering top class products, and best-in-class service. 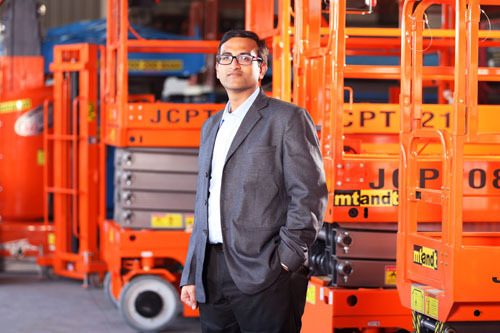 The company has been crowned as the largest Aerial Work Platform Rental companies in India. Mtandt owns Onrent, Portadeck, Mlift, Aardwolf Quickfit, Aardwolf Quicklift, Aardwolf Innotech, Project Dost, Project Dost Plus and Toolsbond. These are ideally suited for medium and light duty work at heights such as glass cleaning, plumbing/electrical /HVAC installations, and setting up banners and billboards. Other applications include industrial use, such as boiler scaffolding, and aircraft scaffolding. - Productivity: Tool free assembly/dissembly, rust-free cantilever attachment which provides horizontal reach. Products offered by the company are in compliance with EN standards, thereby assuring the user of reliability and safety. 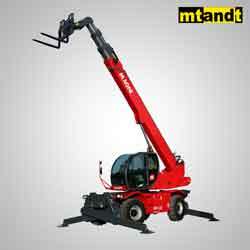 Mtandt offers different types of AWPs to address various kinds of work at height activities, including maintenance and machine building. The single and dual mast lifts benefit the simple vertical up applications of light fixture access, roof cleaning or crane access, with some of them useful in lobbies/atriums of hotels, malls and IT parks. Moreover, they suit all terrain/surface. Scissor lifts, a stronger version of man-lifts used for heavier work, offer better up/down cycles, suiting all terrain/surface except floors with low slab strengths. Both variants are available in Self-propelled and Push-around versions. Also, electric and engine operated (higher models) are available. The company’s boom lifts offer higher versatility with both vertical and horizontal reach, a wide range of heights for reaching virtually any height. Both, electric and engine operated versions are available. All models are self propelled, and are generally used during construction period and even later, during maintenance as well. Mast booms, a good combination of mast design with a short boom benefits the user working in confined or congested areas. Only electric versions of the Mast Booms are available. These are ideal for use on industrial shop floors and machine building activities. Spider lifts: These offer boom configuration with lower ground bearing pressure, and largely benefit users at airports, malls, IT parks and hotels. Truck mounted AWPs and Towable (trailer mounted range) are beneficial to users who would like to transport the machines on long distances. Moreover, they are economical too. 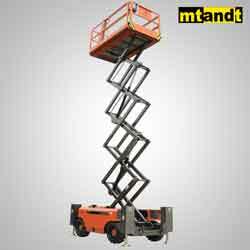 Mtandt range of Material Handling Solutions is beyond the conventional Pick-n-Carry cranes. Telehandlers: These are highly useful for lesser loads needing to be horizontally placed after vertical lifting. Knuckle boom cranes: These are used for brick and augering operations. Mini crawler crane: This is a unique product offering loads to be picked and moved around on shop floors. Duct lifter: These are for HVAC and other electrical components to be lifted vertically up. These are used for providing fall restraint and fall arrest for persons working at heights. Horizontal Lifeline systems: These benefit workers accessing factory roofs during maintenance jobs. Overhead lifeline systems: These are for workers on top of trucks and tankers for loading/unloading bays. Vertical lifeline systems: Used during ascent on ladders to factory roofs, chimneys, communication towers, and transmission towers. Walkway systems: Used for persons on factory roofs. Barricade systems: These offer protection for people on factory roof edges. Mtandt’s specialised Training Division specialises in WAH training. Both basic and advanced courses are offered with certification. Mtandt recently launched a revolutionary product – the Portadeck. This product, which was wholeheartedly accepted by the Ministry of Defence, creates temporary terrain/roads during natural calamities when the existing tar or concrete roads are destroyed during either floods or landslides. A good example of its use is during the recent floods in the southern state of Kerala. With approach roads washed away, and people finding themselves marooned, the Portadeck was used to move people to safer regions.